Just some reviews, and other things. Am I the only one who feels like finding the best shampoo is more of a quest, rather than an easy trip to the store? Well I am here to say that my quest is finally over, and it ended by finding Calia. I have thick, long, slightly wavy hair. My roots get oily 24 hours after the last wash, yet my scalp seems dry and I get extremely itchy patches sometimes (okay, a lot of the time). It’s bad. Dandruff is such a horrible thing! I was looking for a shampoo that not only would not irritate my scalp, but also tame the frizz and make my hair feel soft. I have switched back and forth from many different shampoos and conditioners (s&c). Redken, Paul Mitchell, baby shampoo, Nizoral, Shea Moisture, etc… you get the idea. (Also, I’m not saying these aren’t good. They just didn’t work for me). Okay, so just a bit off topic for a second. For the past year or so, I’ve been trying to use more natural/organic products. I finally thought, “why am I using all these chemicals?”. I haven’t changed all my products and skin care/hair care routines though, but I like the idea of only using natural things in the future. I’ll see how that goes (why are the best things so expensive? )… Anyways, changing to a less chemical ridden s&c has been really great. 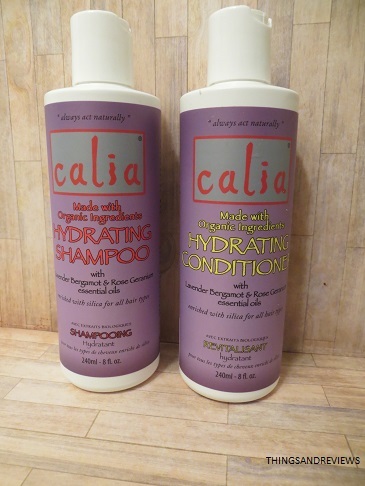 I purchased Calia hair care because HolisticHabits (YouTube) gave a really convincing review of the company. This hydrating s&c (with lavender bergamot and rose geranium oil) is filled with amazing ingredients, and they left out all the bad stuff that are hard to pronounce. I’ve never poured such a crystal clear shampoo into my hand before! Nope! This didn’t completely cure my dandruff 100%, of course. It’s been 2 1/2 weeks since I began using Calia, and it’s been nothing but a positive outcome. Although I do still have the random dry patches on my scalp, the itchiness is not severe. I no longer have the need to scratch my head (finally!). No irritations, as well as less oil the next day after washing. I also have less hair shedding while in the shower and when brushing. My hair feels clean, soft, and healthy; isn’t that what everyone wants? Calia is available in stores only in Canada (it’s a small, Canadian company), but is available to order online. Shipping costs are insane though (understandable I guess, but still). At about $11 a bottle (8 oz), it’s kind of affordable to try out; especially for such pure ingredients. And I’m glad I did because it was so worth it. They have different types of s&c to suit your needs as well (balancing, moisturizing, etc). It’s also available in 4 liter jugs. 4 liters! That sure is a lot. I never thought I’d want to buy that much of one type of s&c, but I love this stuff so much, I’m pretty sure I’m going to have to buy it. I’m happy that my search for the best shampoo has finally ended! If you’re looking for a natural s&c that truly is organic (seriously, you need to see the list of ingredients), rinses well, and makes your hair soft and shiny, this is a brand to try out. Please feel free to leave any comments or questions you may have. I really have been checking out this product because I’ve had tons of build up from the chemicals in my shampoo and conditioner. And I really want to get one that’s actually organic, what are the ingredients for the shampoo and conditioner? I use the balancing shampoo, and the hydrating conditioner. I think it’s a good combo for me. I also have an oily scalp, but kind of dry ends. Thanks so much! But why don’t you use the one or the other s+c set? 🙂 May I ask how many days you can go without washing by now? And how many it were before Calia? Thanks so much, it’s a huge help!